A recipe for a moist chocolate cake made with five types of chocolate. 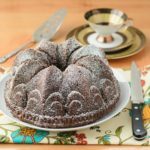 The cake is baked in a bundt pan, glazed, and then finished with a light dusting of confectioners sugar. Preheat oven to 325 degrees F. Grease and flour a 10-cup bundt cake pan. In a bowl over simmering water, melt the 3 ounces of bittersweet and 3 ounces of semi-sweet chocolates. Once melted, remove from the heat and set aside to cool. Sift together the flour, cocoa powder, baking powder, baking soda, and salt into a medium bowl.Whisk to thoroughly combine. Place the mini chocolate chips in a small bowl and add a tablespoon of the flour mixture. Stir to coat chocolate chips with flour and set aside. In the bowl of an electric mixer fitted with a flat beater, beat butter on medium speed until smooth, about 1 minute. Gradually add the sugar and continue to beat until blended. Increase the speed to medium-high and beat until light and fluffy, about 5 minutes. Turn off mixer occasionally and scrap down the sides of the bowl. Reduce speed to medium. Add eggs, one at a time, beating well after each addition. Scrape sides of bowl as necessary. Add vanilla and beat to combine. Reduce speed to low and add the flour mixture in three additions, alternating with two additions of sour cream, beginning and ending with flour mixture. Mix until just blended (do not over-mix). Remove the bowl from the mixer. Stir in the melted and cooled chocolate and mini chocolate chips. Pour batter into prepared bundt pan. Bake until a toothpick or cake tester inserted into the center comes out clean, about 1 hour. Cool cake in the pan for 10 minutes. Remove cake from the pan an place on a wire rack over a sheet of parchment or wax paper. Brush cake with glaze using a pastry brush. Cool cake completely. Dust with confectioner's sugar if desired. While the cake is baking go ahead and make the glaze. Place the sugar and water in a small saucepan. Heat until sugar has dissolved. Remove pan from the heat and stir in chocolate liqueur.